RIO DE JANEIRO, BRAZIL – Widespread protests marked Brazil’s Independence Day celebrations yesterday. The national holiday, typically celebrated with military parades in the streets of state capitals and numerous cities throughout the country, instead saw a wave of demonstrations, some of which turned violent. Protesters clashed with police on Presidente Vargas avenue in Centro yesterday, photo by Fernando Frazão/ABr. Protests against various issues, including corruption and poor quality of public services, sprung up in 150 cities but the turnout was significantly smaller than the numbers seen during the massive protests that took place in June. Security had been heightened in anticipation of the protests, notably in the country’s capital of Brasília. There, President Dilma Rousseff participated in the traditional Independence Day military parade without incident. 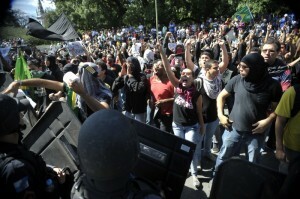 However, demonstrators and police later clashed outside the Congress building in Brazil’s capital. Police used tear gas and rubber bullets to keep the protesters at bay. Some demonstrators also attempted to make their way to the Mané Garrincha stadium, which was hosting a friendly match between Brazil and Australia on Saturday afternoon. When some protesters broke police-formed barricades, the police reportedly launched tear gas and dogs. At least fifty people were detained, including fifteen minors. In the streets of Rio de Janeiro on Saturday, the traditional military parade was interrupted by protesters. Demonstrators and police clashed on Presidente Vargas avenue in Centro. A group of masked protesters known as the Black Bloc removed the Brazilian and the Rio de Janeiro state flags, set fire to them and and hoisted two black flags, representing the Black Bloc group, in their place at the Zumbi dos Palmares monument. Police try to control the crowds in Brasília where a group of protesters tried to enter a Globo TV building, photo by Fabio Rodrigues Pozzebom/ABr. Police and protesters confronted each other again later in the South Zone neighorhood of Laranjeiras. Groups of protesters there reportedly set fire to trash bins and a phone booth. Two bus stops in neighboring Largo do Machado were also vandalized. Drivers were advised to avoid the streets of Laranjeiras and the Santa Bárbara tunnel. Two hundred protesters reportedly attempted to gain access to Palácio Guanabara – the seat of the Rio de Janeiro state government – by scaling barricades but turned back when Military Police launched tear gas. Bars and restaurants closed when tear gas was deployed by police officers as the conflict spread to bohemian Lapa. 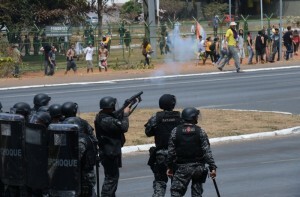 In Belo Horizonte, the capital of the state of Minas Gerais, at least two people were injured and as many as 27 arrested when protesters clashed with police there during their Saturday afternoon demonstrations. In São Paulo, at least two banks were reportedly vandalized during protests. Demonstrators met police in front of the City Council building. Confrontations between police and protesters were also reported during demonstrations in the cities of Fortaleza and Curitiba with protests in other cities remaining mostly peaceful. Although the numbers of demonstrators has decreased from the millions that took to the streets in June, the protest movement is showing no signs of stopping as the country prepares to host next year’s World Cup and the 2016 Summer Olympics.